What is "color mode" and why does it matter? 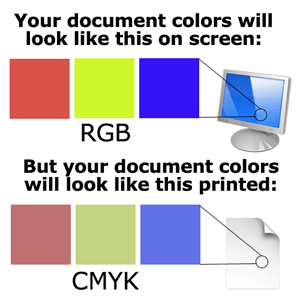 All the colors in a printed document are made up of 4 colors: Cyan, Magenta, Yellow, and Black (CMYK). All the colors on your computer screen are created using three kinds of colored light: Red, Green, and Blue (RGB). The combination of RGB light creates white. However, the combination of CMYK inks creates black. Therefore, it is physically impossible for the printing press to exactly reproduce colors as we see them on our monitors. To ensure your project has the colors you really want, it's important to use the correct color mode - CMYK. Not sure how to do that? Learn how here. What does it mean when a picture is "high resolution" or "low resolution"? What does "DPI" mean? Simply put, a "high" resolution picture has more pixels than a "low resolution" picture. 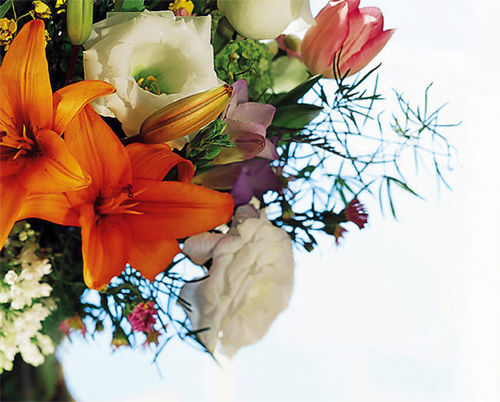 Generally a high resolution picture looks smoother than a low resolution one, especially as you zoom in further. DPI is short for "Dots per Inch", a higher DPI means a higher resolution and a lower DPI means a lower resolution. Most images found on the web are low resolution (72 dpi). 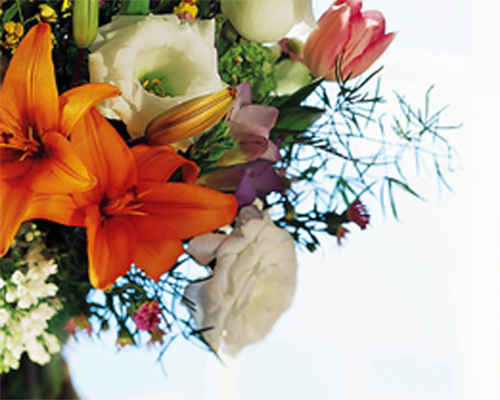 Images suitable for print are high resolution (300dpi or higher). And usually the resolution on your computer screen will not match how it will look printed. 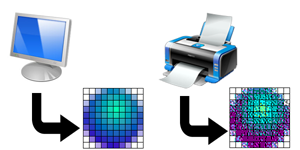 This is because monitor displays usually have about 72 to 116 ppi; a 10×10-pixel image on a computer display usually requires many more than 10×10 printer dots to accurately reproduce, due to limitations of available ink colors in the printer. To get a good idea of what your image will look like printed, zoom in up to 300-400%. If it still looks smooth, it'll probably print well, but if it looks pixelated, it's probably not suitable for print. Can the DPI be increased with my photo editing program? No. Forcing a low resolution image is saved to a higher resolution with no changes in dimensions or "Upsampling" adds more pixels/dots per inch (dpi), but creates blurry images, ugly blocks of color, and high contrast in images. The only way resolution can be improved is by decreasing the image size or by recapturing the image at a higher quality setting. What is a bleed and why does it matter? 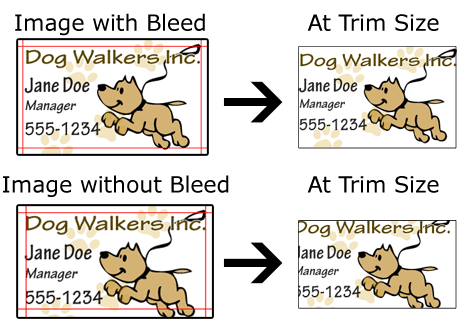 A bleed is when an image extends beyond the trim edge of the printed sheet. 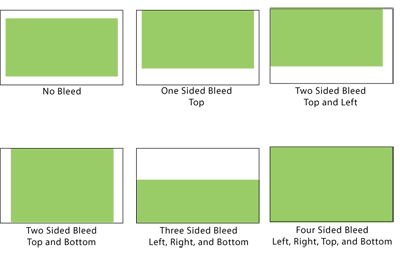 It is important to include bleeds in your artwork files if you want the image to extend to the edge of the paper for your final printed piece. This is because without it, even the slightest cutting error will be visible. As illustrated to the left, if the trim is even slightly off, the bottom left hand corner in this case will look fine, but we will pick up a white area on the top and the right. 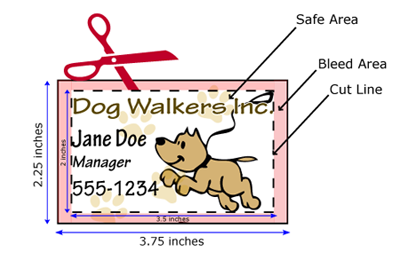 We encourage you to create a design with a full-bleed - i.e., extend the image off all four sides of your design keeping the important information in the "safe zone" - to ensure the best quality for your printed piece. This ensures you don't lose anything important when your project is cut down to size. Action Printing would prefer you to package all the fonts you used with your document in case changes to the actual text must be altered. However, if font sharing is an issue you have the option is to convert your text to outlines. Now the text is no longer "text" but vector shapes. Of course. Action Printing has several graphics experts on staff to help you prepare you files for the presses. If you don't even know where to start or just want someone to double-check if your files are truly print-ready, our graphics artists are here to help. We've developed several templates as guides to make it easier when set up your files for printing for minimum hassle and a quick turnaround. Each template provides information on product size, layout, bleed, safety zone, and any folding or mailing guidelines for up to four appropriate programs. Click here to view our template catalog. Can I use your templates? Yes, please! Our templates are completely free for anyone to use. Using our templates helps you to create a file that's truly print-ready and will usually lead to a quicker turnaround. How should I set up my file? Consider using one of our templates as a guide and reviewing our guidelines for set-up and our print-ready checklist. If you want to create your own design, but the pre-press requirements are a little overwhelming, you can work with our graphic design team to get your file print ready. Just give us a call at 1-888-226-5533. How can I give you my files? If it's a smaller file, you can e-mail it as an attachment to info@action-printing.com. If it's a larger file, you can use our "submit files" feature on our website with our easy upload form. Or if you prefer, you can drop your files off at the shop on a disk, CD, or flash drive. If you have several files to submit, you might consider compressing them for a faster transfer. Learn how here. We accept files in true page layout programs including Quark Files (.qxp and .qxd), Adobe InDesign (.indd), and Adobe Acrobat (.pdf) files as "print-ready" files. We can also work with Adobe Photoshop (.psd), Adobe Illustrator (.ai), Adobe Pagemaker (.pmd), Corel Draw (.cdr), Microsoft Word (.doc and docx), Microsoft Publisher (.pub), Microsoft Powerpoint (.ppt and pptx), Microsoft Excel (.xls), and Microsoft Works (.wps) files. However, we don't consider these "print-ready" because files created in these programs will require time for our graphics department to prepare them for our presses. If you use America Online, you should be aware that AOL limits your inactivity on the web and could disconnect you if you are not a current, active user. Uploading files appears to be inactivity to AOL. It is recommended that you keep your AOL email account open at the same time you are uploading your files. This can help "trick" AOL into to thinking you're still active and prevent the possibility of getting disconnected during your file upload. What rights does Action Printing hold over my work? After payment has been rendered, Action Printing holds no rights or copyright in your work and makes no claims or restrictions on the ownership of your work. Rights and copyrights remain with you as the author and creator. You continue to own the rights in your name or, if you have arrangements, on behalf of others. Your purchase and use of any Action Printing's services does not undermine your rights or copyright.